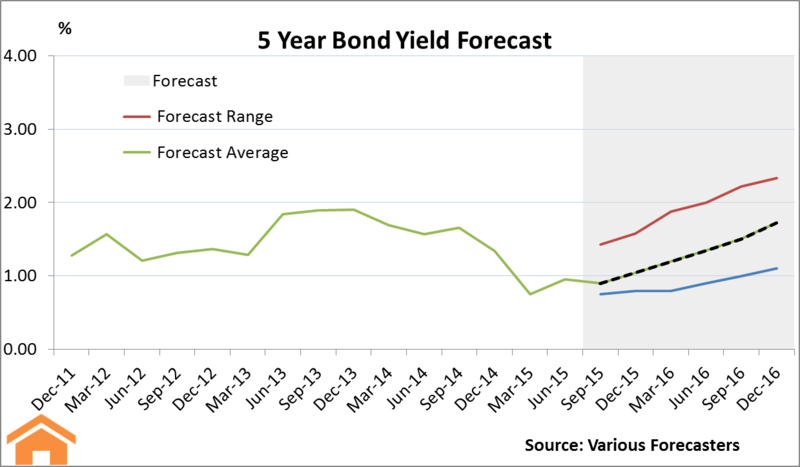 This article presents an outlook for Canadian interest rates over the next year and half. More specifically, the 5 year Government of Canada bond yield, which is an important driver for mortgage rates. However, as we continue to reiterate, the consensus forecast for interest rates to increase by about a full percentage point has been the case for some time now. With Canada entering into a technical recession in the first half of 2015, many are wondering what the Bank of Canada and the market will do in the near future. The forecast for Canadian interest rates depends on a few factors, which leads us to our next section. If you are trying to decipher what will happen with Canadian interest rates in the near future, there are a few things you should monitor. The Bank of Canada is unlikely to raise their overnight target rate ahead of the Federal Reserve, as this would likely push up the exchange rate. A higher exchange rate might be detrimental to Canadian exporters and manufacturers, which are the sectors that the BoC has long looked towards to be the driving force of economic growth. So don’t expect the Bank to do much to harm these sectors. That being said, most analysts expect the Federal Reserve to raise interest rates either later this year or in early 2016. What is the Outlook for Economic Growth? Interest rates don’t just move on their own. As other investments become more attractive (higher returns, lower risk), investors move their money out of government bonds. This lowers the price of bonds and increases their yield (increases interest rates). As such, signs and expectations of higher and more stable economic growth will generally put upward pressure on interest rates. So what is happening in the economy? The outlook for exports is brightening, thanks to stronger economic growth in the U.S. and a depreciated currency. This should, in turn, provide some support for Canada’s manufacturing industry. All told, the economy is expected to grow at a faster rate in the latter half of 2015 and see even more growth next year. Ultimately, it is this forecast increase in Canadian GDP growth that is driving the forecast for higher interest rates in Canada.